One of the most common types of articles seen on the Internet today are photo stories. A photo story is a type of article that literally tells the main part of the story using photos, with only two or three short sentences per photo. Websites such as Scribol, Topix, and Headcramp are just a few examples that have photo stories dominating them. Usually media-rich (a photo story layout permits for multiple video-ads), the main value of a photo story is not just to entertain but also to educate. A photo story can comprise a list, or detail a historic event that contains little-known information, or even a mystery. An example of this type of photo story is “Farmer Knocks Over A Rock And Discovers A Secret That Had Been Buried For 5000 Years” at Headcramp. The most important thing to remember when writing a photo story, however, is to make sure the title is eyecatching and intriguing enough to encourage web users to click on the link to the article. In lay terms such a headline is known as “clickbait”. Because most of the published photo stories online are sponsored by advertisers, naturally readers are also encouraged to click on one of the many ads appearing on the same webpage the photo story appears on. As with any other type of story, the writer should have a working title before composing the actual photo story, then once the story is finished, come up with the actual title. For example, the working title of a story might be “Nat temple in Rakhine province of Myanmar” then changed to “Look at what one Rohingya man found beneath a Nat temple in Myanmar.” Then the photo story might show pictures of the Nat temple, the lay of the land, and the secret of what is beneath the temple foundation. The number of photos used in a photo story might vary depending upon the website the story is being written for, although anywhere between ten to fifteen images on average can be used. If older non-digital photos are being used for the story, they can be scanned then repaired in image editing programs like Photoshop and Inpaint to make them web-ready. Ideally, all images being used should measure the same size, for example, 600 x 500 pixels. As with any other story or article being written, do not forget to edit and proofread before submitting it to the chosen website for publication. 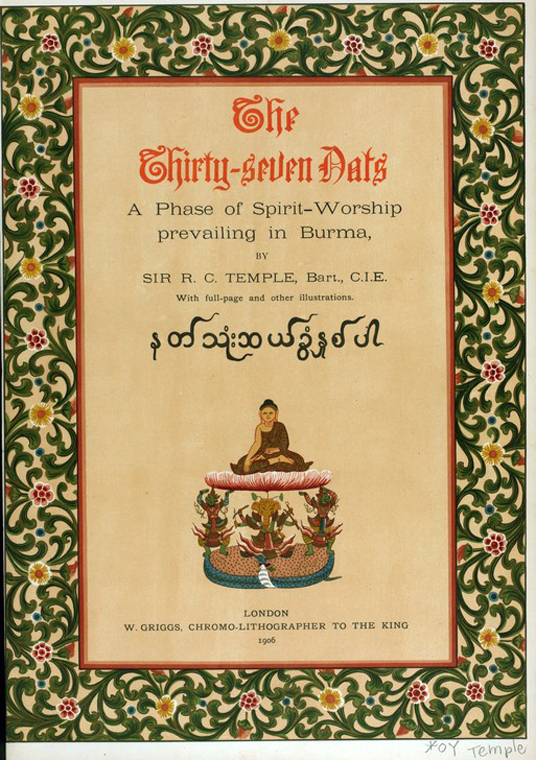 The title page from the book Thirty-Seven Nats, a Phase of Spirit-Worship Prevailing in Burma, by Sir R. C. Temple. London: W. Griggs. 1906. Public domain, New York Public Library Digital Collections.